How Much Honey Per Hive? “How much honey did you get this year?” is a questioned often asked by beekeepers of each other. “How much honey do you get per hive?” is a similar question asked by customers and folks contemplating going into beekeeping. The first question I hate. It’s a bit too much like a competition. How far can you throw? How much can you lift? It all depends on a lot of factors, so comparisons between beekeepers are at best silly. The second question: “How much honey can you (or did you) get per hive?” is a good one. The answer will still depend on a lot of variables. But it is nice to know the average in your area, and what other beekeepers are going though. Eastern Washington State burned this year. Not just in the sense of burning hot temperature. It actually burned – for weeks. Rain has been scare there in the past few years (as with many places in the US and world-wide). This year was horrid. Wildflowers did not produce nectar – they need water for that. 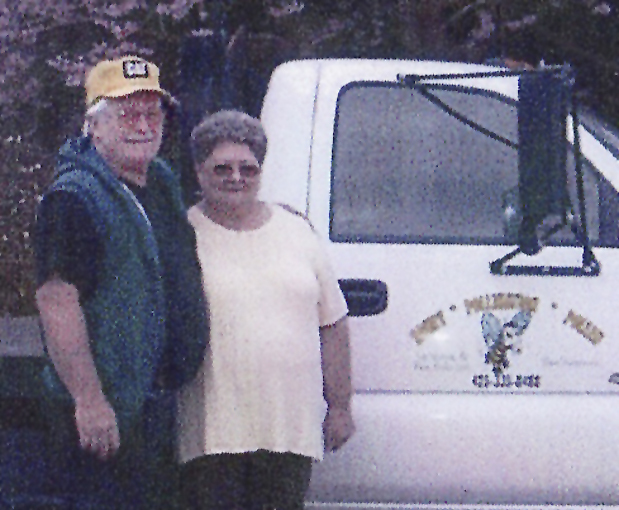 One commercial beekeeper I know found that over half of his hives did not have honey in them. Think about your business. What affect would if have on your income if you could only produce half of what you create, be it widgets or proposals or bees or honey. To say the situation is troublesome is an understatement. Western Washington did OK this year. When it’s “dry” here, that means we might get a few weeks of clear weather in between rainstorms. Which means that the drought’s effect in the northwest corner of the state was to produce a remarkably good honey harvest this year. 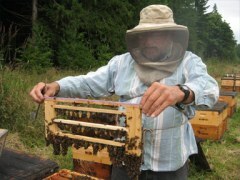 I have two friends, Ron Babcock and Pat Ray, who have been beekeepers in Western Washington State for over 20 years. I asked each of them how much honey they figured they would get from a west Washington hive in an “average” year. Each one promptly said a study had shown the state average is 30 pounds of honey per hive. Bear in mind that average is for the state of Washington. 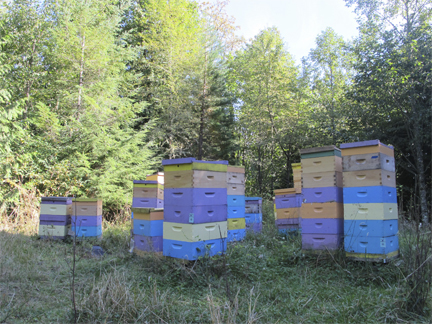 The majority of Washington’s honey is produced east of the Cascade Range, a drier area than our wet area lodged between the Salish Sea and the towering mountains. 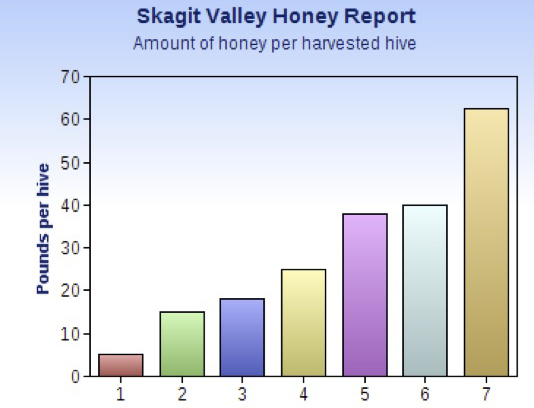 Skagit Valley is in the county just south of Whatcom County, where I live and keep bees. Skagit Valley is about 50 miles south of the Canadian border and stretches from Puget Sound to the high Cascade mountain range. It has agricultural areas, river valleys, cities, towns, and high mountains. The Association has beekeepers from a range of these areas. Robert asked members to volunteer how much honey they harvested from their hives and how much honey they averaged per hive. All reporting would be anonymous. Seven members supplied the more important question: “How Much Honey Per Hive”. The lowest was 5 pounds-per-hive, the highest 62 pounds-per-hive. I took an average of 18 pounds from each of my hives. This is an average: some hives delivered nearly 80 pounds of honey; some delivered none. Often these were in the same bee yard – every hive is unique, some have better foragers, some decide to replace their queen or swarm in the middle of a honey flow (a good moment for them – lots of food; a lousy moment for the beekeeper – little honey for harvest). I could have taken more, according to all “bee wisdom”, but I leave a lot of honey on my hives: 70 pounds for each full hive; 50 for smaller hives. 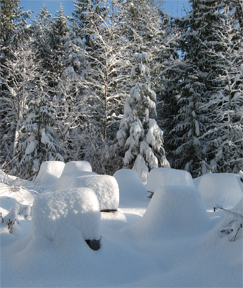 We have some long winters here. 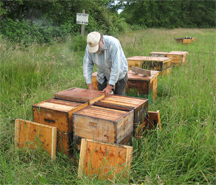 The smaller hives are often nucs that were started earlier in the year. By fall they have enough bees to over winter, but have often not put up enough stores. We do not see nectar in my area from October to March (that is if it does not rain throughout March). The extra honey for these hives is pulled from the honey I’ve harvested for sale. I would rather harvest less, but give the bees real honey and not feed syrup (I do good syrup, but it’s not honey). Diseases can be passed between hives this way, but I am willing to take that risk to give a smaller hive honey for the winter instead of feed. In the spring, I sometimes have to rearrange frames of honey because the bees have clustered in a manner that they are missing their stores, but at least it’s still honey. The bees are still buzzing around, but there are few flowers in bloom here. The rains have arrived (always after October 13 for some reason). The hives are pretty much shut down for the winter. Me? Well, I’ve got boxes and frames to make and stain. Frames to wire. Salves to make. As with most beekeepers in this area, the work never really ends, it just changes to inside work as we stare out at the hives and hope that all is well with the bees until we see them in the spring. This entry was posted in Beekeeping, Brookfield Farm Bee Yards, Honey and tagged 2014, Beekeeping, Brookfield Farm, harvest, honey, honey per hive, Maple Falls, Washington. Bookmark the permalink.